You�re thinking about purchasing an Azub Tricon? It�s one of the best decisions you�re going to make. It�s adjustability, reliability, agility, and beauty built into one impressive machine. 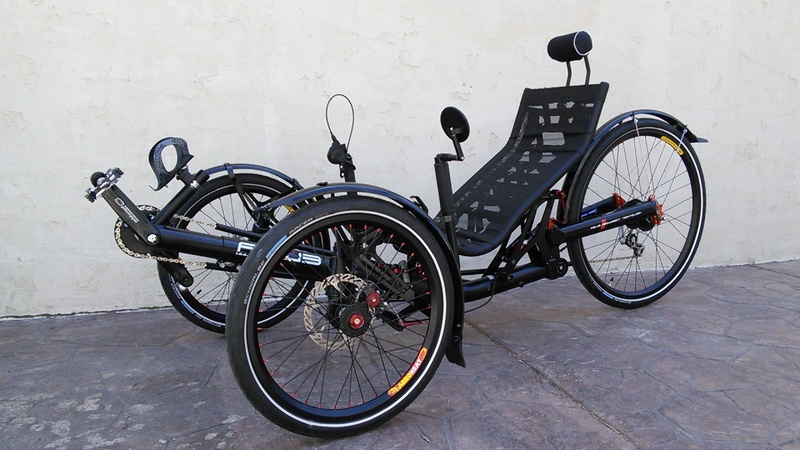 With rear suspension, the unique Fold-to-Flat design, durable components, and your choice of a 20 or 26-inch rear wheel, the Tricon is sure to exceed any rider's expectations of what a recumbent tricycle should be. 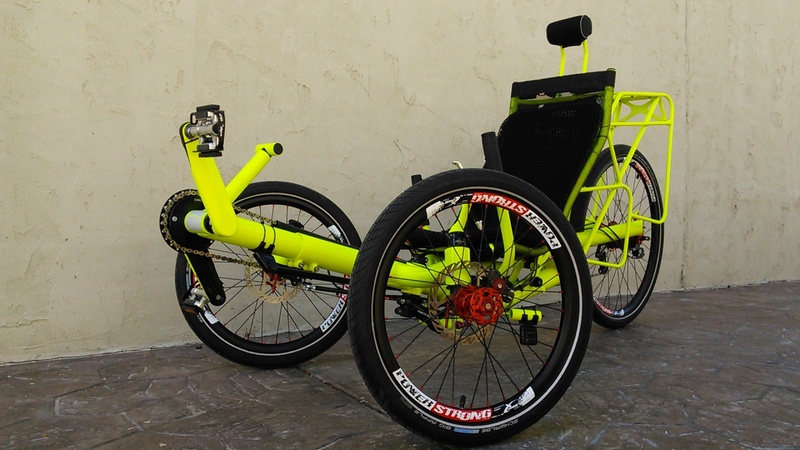 One of the driving ideas behind the Azub Tricon was to give riders the ability to take their trike anywhere; rear suspension was an added bonus, and the Tricon�s drivability is second to none. Thanks to Azub�s unique Fold-to-Flat (F2F), the Tricon can be folded two different ways. Option one is to simply remove the seat and fold the trike in half, cutting the size of the Tricon down significantly. If you need to fold it down even more, you can remove the rear wheel, and use the quick-release mechanism to fold the rear fork. If that still isn�t small enough, the two front wheels can be removed quickly and easily to get an incredibly small package. The F2F system isn�t the only aspect that makes the Azub Tricon a machine you want to own. Not only is it aesthetically pleasing, it's also capable of amazing adjustability. You can fine-tune it until you find a perfect riding position. Azub calls it their Ideal Position System, and we must admit the name is spot on. 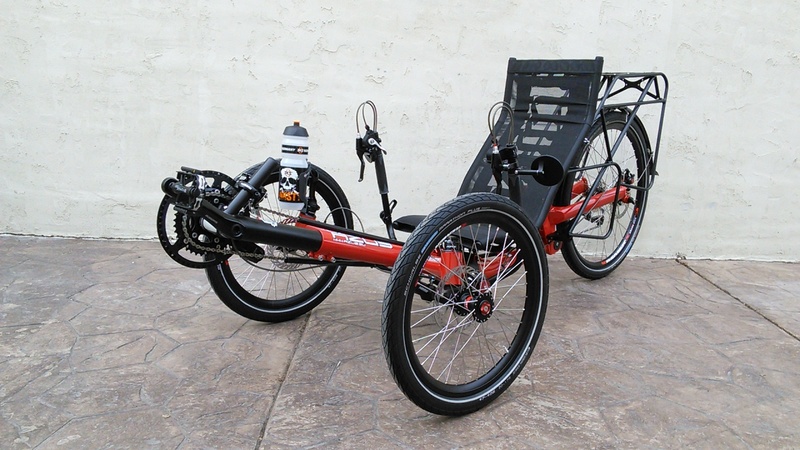 You can slide the seat on the frame, change the angle of the seat by twenty degrees, adjust the handlebars, and slide the boom in and out to fit your pedal reach. You can adjust the Tricon to you and look forward to superb riding comfort every time you get in the saddle. As soon as the Tricon is fit to the perfect position, you�re going to take a seat and be amazed by the rear suspension. Azub has put a lot of work into eliminating problems like lateral and torsional flex, and the final rear suspension design on both the Tricon 20 and 26 is hard to beat. Choosing between the 20-inch or 26-inch rear wheel can be a tough decision. You have to ask yourself: �Where and how will I ride?� Many riders have praised the Tricon 20 for being more compact and for it�s agility It performs better when cornering and has a smaller turn radius. 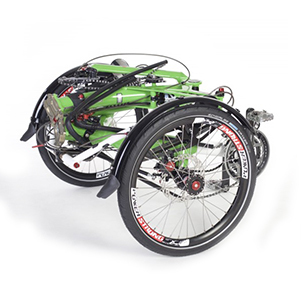 Another benefit is that all three wheels are the same size which makes carrying spares less of a hassle. However, with the 20-inch rear wheel, the derailleur is close to the ground and more vulnerable to damage from dust and debris. The 26-inch rear wheel looks incredible. It rolls mores smoothly and has better traction than the 20-inch wheel in sand or snow. A common issue with 26-inch rear wheels is poor lateral stifness. Azub dealt with this problem by upgrading to a wider hub. The geometry of the Tricon 26 was adjusted in order to maintain the handling characteristics of the Tricon 20, with the added comfort of a larger rear wheel. If you can�t make up your mind, you could always get both!